The HD Universal Converter is billed as 'a professional HD signal universal converter' and carries a Full HD 1080 logo on the box. The latter is rather odd as what we have here is an upscaling device that, while it can take a Full HD/1080p source, outputs in 720p only. Essentially, it works by deinterlacing the incoming signal and outputting it via the front-mounted HDMI. This is potentially useful if you have lots of standard-definition equipment including receivers feeding an HD-ready flatscreen TV. The device itself is about half the size of (if a little deeper than) the average FTA satellite receiver and runs off a 5V power supply. The source can be connected via a rear-mounted Scart socket or a component input located on the front for which a lead is provided with added phono jacks. An additional 3.5mm audio output sits on the rear for hi-fi systems. A button is used to toggle between Scart and component sources indicated by green and blue LEDs but no remote is provided for switching between them from across the room. We tried upscaling SD TV via the RGB Scart and component outputs on our Humax Freesat receiver. While results appeared to be perceptibly smoother viewed on our 42in test plasma it wasn't as good as the upscaling we've seen included on recent receivers. Plugging in a feed from our non-HDMI equipped (and therefore non-upscaling) Xbox 360 via component, a 480p signal from a DVD of No Country For Old Men also saw a minor increase in sharpness, but don't expect it to compete with a 720p Blu-ray picture. So much kit these days comes with built-in upscaling to 1080i (including DVD players for under £50) that the merits of spending £70 on a separate upscaler are debateable when you could put the money towards said equipment. We suspect the converter will find its niche as a way of feeding projectors with a better picture from a standard-definition receiver. As Keene points out, it's also a way of connecting SD equipment to an HDMI switchbox while boosting the picture at the same time. 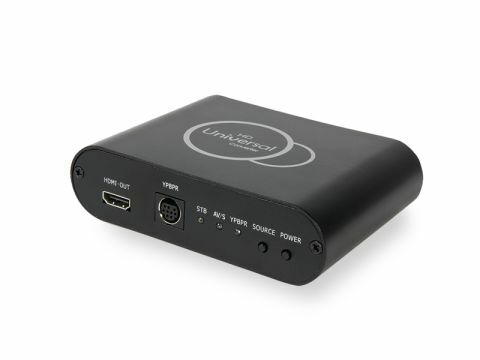 If you can't bear to part with your old receivers or home cinema hardware but your new TV or projector is showing up its lack of picture prowess, this converter could be what you need. Or it could just be time to upgrade your kit instead.